Just Jingle: Happy Independence Day! Happy Independence Day to all of my US readers! 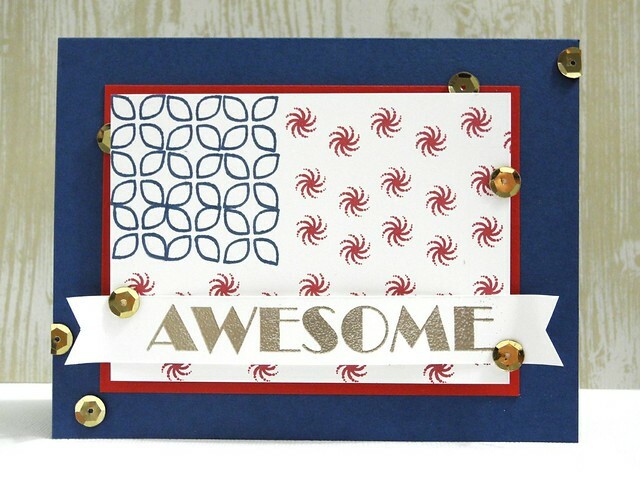 I am lucky enough to be on the CAS-ual Fridays Stamps blog on this super fun holiday (The 4th of July is one of my absolute favorites, actually) and I have a fun, patriotic card to celebrate! I pulled out a few different sets to create my fun flag design. I love how it is whimsical and artistic and just plain FUN! I used one of the flowers from Wallflower to create the star field and then used a super fun border from Countdown to create the dancy pantsy stripes. (Yup, that's what we're calling it. Because I want to, that's why. And it's my blog and I get to make these decisions. For reals, though. Dancy pantsy.) I used post it tape to mask off the areas while stamping. The sentiment is from my favorite sentiment set, Wait for It. If you don't yet own this stamp I am concerned. Very, deeply concerned. You should have that checked. 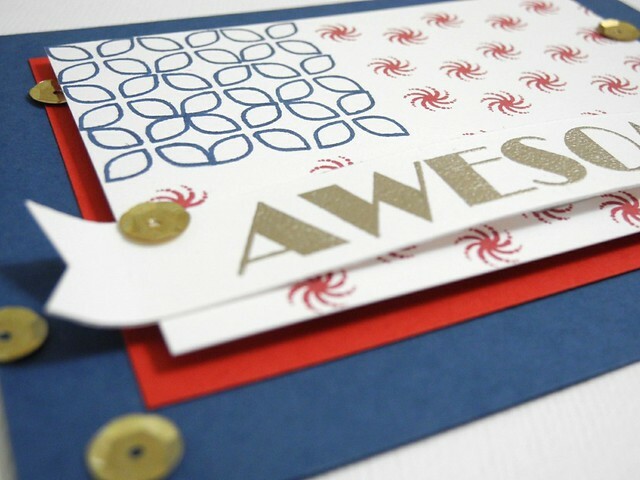 A few sequins add to the celebratory feel of this card, along with the embossed sentiment on the wavy banner. It's just a happy-let's-have-a-party kind of card. So go ahead... have a PARTY! Happy Independence Day! OH! And to celebrate, CAS-ual Fridays Stamps is offering FREE shipping all weekend! Just use the code FREEDOM at checkout! This is one AWESOME card! ;) Love! Happy 4th to you...Enjoy! It is AWESOME!!!! Love your card! THIS is awesome!!! Love how you created the look!!! Awesome design! You're so clever! Oh I love how you snipped the sequins - too cute!! Catch A Wave! - Newton's Nook Blog Hop Time! Sometimes You Just Need to Play! Spots and Dots and Dinosaurs! I Love You More Than Ice Cream. That's a Lot. Felt and Wood and Paper, Oh, MY!